Doctor Wars: The Hospital Strategy Game társasjáték - Magyarország társasjáték keresője! A társasjáték érték! A Doctor Wars: The Hospital Strategy Game egy remek társasjáték, 2 - 4 játékos részére, az átlagos játékidő rövidebb, csak 1 óra. A társast, 10 éves kortól ajánljuk kipróbálni. A játékmenet erősen épít a pontról pontra mozgás mechanizmusra. The board consists of 12 hospital rooms bordered by hallways. Into each room is placed a randomly chosen patient card, which in turn is covered with four randomly chosen cards that are turned face-up. Each of those four cards represents an ailment. Each patient's ailments must be cured in the order that the cards are stacked, top to bottom. 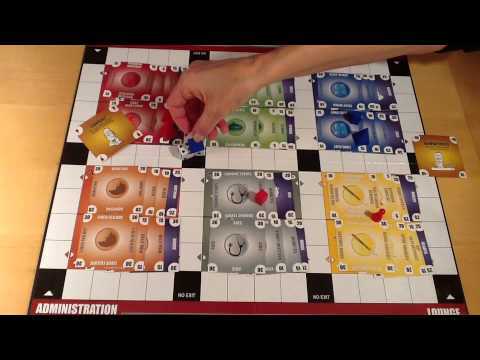 Each player controls a nurse, resident, intern, and attending physician. These pieces move from room to room curing the ailments and scoring points for the cures. The more difficult cures are worth more points. Interns can move the greatest distance in a turn, doctors the shortest, but doctors and residents outrank interns. Credit for a cure goes to the highest ranking doctor in a room or, in case of a tie, to the player with the most doctors in the room. Nurses can block access to rooms. The games ends when all patients are cured of all ailments. The player with the most points wins.